MAY. 06 2012 about Sorry! nitpicking. APR. 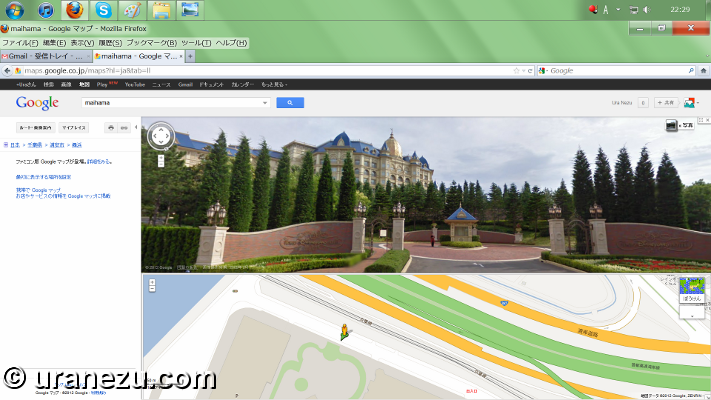 06 2012 about TDR on Google Maps. When working part-time as a cast member in TDL, I was taught that every single item in the park are sold by hand. Disney place importance on the warm communication between guest and cast. Therefore, there are no vending machine in the park. Now, there are vending machines inside the park. The original, precious, white... Space Mountain the iconic attraction of Tomorrowland. A vending machine was placed under this attraction. A robot...the design of the vending machine in Tomorrowland is simplistic for me. I can't feel any Disney-ness from this. Here are the next vending machine in TDL. Do you see it? There is a reflection of "Castle Carrousel" on the vending machine window. You can find how close the vending machine is to center of Fantasyland. The design of the machine from "Mad Tea Party" (AKA. "Alice's Tea Party" in TDL.). However, I think it is not about blending in with Fantasyland. In my opinion, it's not beautiful scenery with the vending machine. 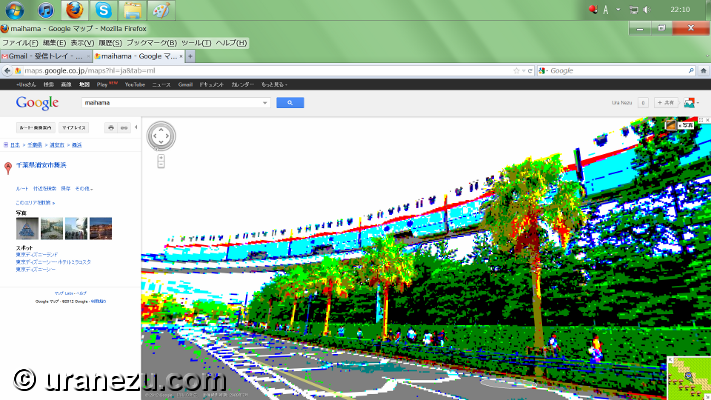 I think it is the least Disney like landscape. The last one from Westernland. This place is located behind of "Slue Foot Sue's Diamond Horseshoe". Please imagine that guests queue at the vending machine to buy and heavy bottled beverage pounding echoed in Westernland. Can you believe it? Summer is approaching, and it has gotten muggy than hot. In other words, we will be in the heat stroke season. Heat stroke is a physical disorder caused by a sudden rise in body heat due to high environmental temperature and humidity. Japan is very humid, therefore, many people are being rushed to hospital with heat stroke every this season. We must be very careful about it on sunny summer park. I think I understand why OLC placed the vending machines in the park. The vending machine may be a one of the preventive measures against for heat stroke. In anticipation of many guests who cannot get a beverage quickly from a small wagon. 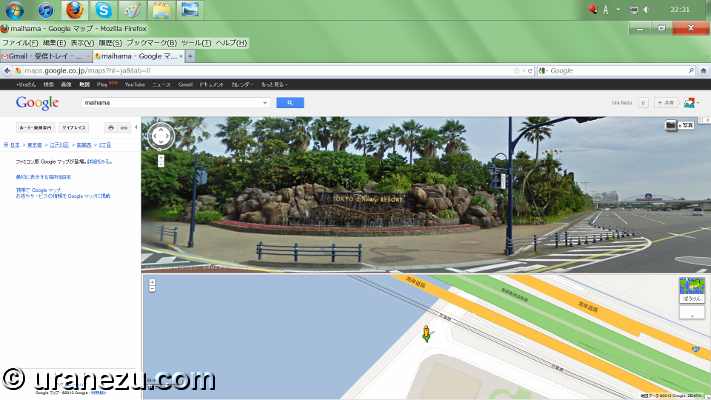 We can find elaborate, neat water fountains all over the place in TDR! But wait! It is not hand wash sink. Many guests just use the water fountain as hand washing station. Please slake your thirst with water by these uniquely decorated water fountains and feel an imagineers the great forefathers' passion. "Disney's Easter Wonderland" is still going on in TDL. This event has started in April and continue until the end of June. During the special event, we can enjoy the egg hunt. A hiding place and reward of an expert course the one of the egg hunt is changed every month. The expert's rule is searching for the egg with a short description of hiding place and a picture of a tiny fraction of it. Now in June, so I report the May's egg hunt without worry of the spoiler. The hint was "A landing boat with 20000 plate." This life ring-like egg from a house top of "Boiler Room Bites" the food counter in Adventureland. "A red craft with a luggage is surrounded by a tropical plant." This golden baggage-like egg from vegetation near "The Enchanted Tiki Room: Stitch Presents Aloha E Komo Mai!". "A small theater with a little swingy strings dancers." This Cossack dancer-like egg from "Pinocchio's Daring Journey" the dark ride in Fantasyland. "A trophy of a company employee who collect an energy." This Bowling ball-like egg from the showcase inside the "Monsters, Inc. Company Store" the merchandise shop in Tomorrowland. "An inside a fence near a saloon with a skilled gunfighters." This cactus-like egg from the vegetation near "Westernland Shootin' Gallery". After the searching, I got a charm with holder as a reward. In May, the charm was silver Donald-shape egg design. I will report the final, June's Egg Hunt expert course in soon! The expert's rule is searching for the egg with a short description of hiding place and a picture of a tiny fraction of it. Now in May, so I report the April's egg hunt without worry of the spoiler. The hint was "A side of a wheel in African collectables." This barrel-like egg from a seating area of "China Voyager" the counter-service restaurant in Adventureland. "An entrance with a mischievous stray's footprints"
This paint-smeared egg from the entrance sign board of "The Enchanted Tiki Room: Stitch Presents Aloha E Komo Mai!". "A next to an owner who made a waterlogged mountain." This acorn-like egg from "Rackety's Raccoon Saloon" the food counter in Critter Country. "A shop window has a bunch of sweet golden rooms." This hunny pot-like egg from the window of "Pooh Corner" the merchandise shop. "A between a cannon and a something pink in a center of a zany town." This Mickey color egg from the house top of the ToonTown City Hall. After the searching, I got a charm with holder as a reward. In April, the charm was gold Mickey-shape egg design. I will report May's expert course in June! Could you see the annular solar eclipse from your house? or Did you have a good view of it? I hope you enjoyed it. From Tokyo where I live could watch it through clouds. We can enjoy the moon Cheshire Cat frequently, however the sun Cheshire Cat is very very rare! Duffy the Disney Bear, it might be the most profitable member in TDR, now his event "Mickey & Duffy's Spring Voyage" has held in TDS. From official TDR website said, "In this event, Mickey Mouse and Duffy are eager to show their beloved Minnie Mouse and ShellieMay what spring is like around the world, so the four adventurers set out on a voyage together. At each port of call? Italy, New York and the Arabian coast? the four join their Disney friends and Guests in celebrating the spring festival of that port. In his first starring role, Duffy, one of the most popular characters at Tokyo DisneySea, joins Mickey Mouse in this special event. Book passage with their four travelers in joyous search of spring around the world, surrounded by the beauty of spring flowers." The event term is as follows: 3 APR. 2012 - 30 JUN. 2012. As previously noted, OLC put a lot of effort in marketing and promotion before the event. I got some these advertisement about the event. 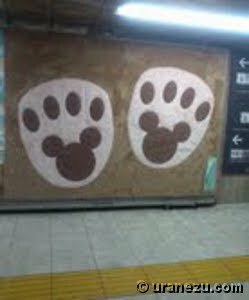 The fur advertisement on a wall of subway accessway in Shibuya. 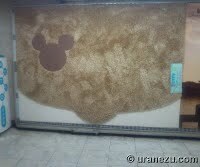 This fur was real material of Duffy plushie. Everybody stroked it then took a picture. Back to TDS, the below sign gives evidence of the most profitable character. During this event, a pretty Duffy photo spots everywhere! This event use a lot of a plastic flowers. I feel faintly sorry for them. I like plastic flowers which are decorated inside queue line area or attraction, however, when it comes to outside, the artificial flowers with real vegetation look slightly odd. 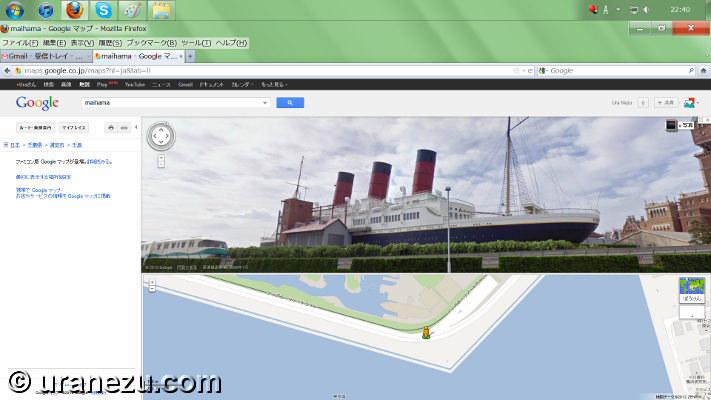 The below pictures from Cape Cod area in American Waterfront. These are very cute decorations for the event. And I was really impressed by the idea which a lid uses for Duffy's ears. However, I couldn't feel any background story from these pretty decorations. I think the "American Waterfront" the theme port label and Duffy label are lovely, but I also feel they are just a decoration. For, as its name suggest, "cod" is a local specially of Cape Cod from the background story. I think a cod roe tin design or hand-painted like Duffy can give more Cape Cod village theme. I hope the Disney spirit something like that will come back again to TDR. Anyway, Duffy lover will feel great joy and satisfaction with Duffy food, Duffy merchandise, everything Duffy. MAY. 06. 2012 about Sorry! nitpicking. 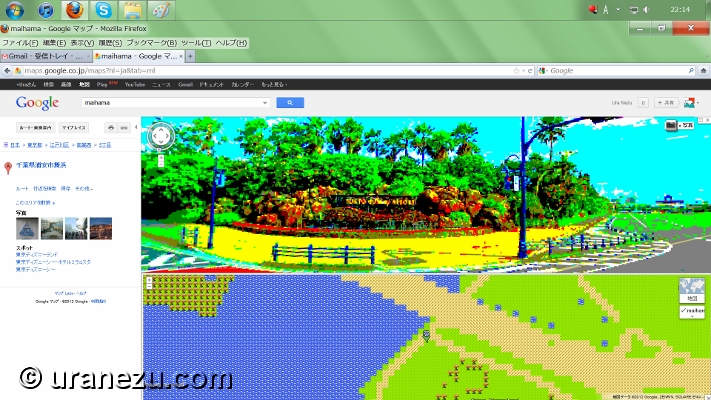 Have you ever visited Park Restaurant Menu of my website? I report the menu of restaurant in TDL and TDS occasionally. I take many photos of a menu board at each restaurants. Today, I would like to show you a little my notice. At that time I had found a something concerning in a restaurant when I took a picture for the menu page of my website. The one matter for concern was that an English notation on a menu board at "Refreshment Corner" the counter-service restaurant. Look at the below pictures of the menu board at the restaurant, there are no English for beverages, there are only beverage logos. You could understand Coca-Cola, I think you are familiar with them in your country. However, look at below pictures. Can you imagine what kind of a drink from only these beverage logo? In April 2012, I went to the restaurant to check for an Easter menu. My concern menu board has changed like below. That's nice! I'm very happy to see that! The above picture was taken in 2011 summer. The below picture was taken in 2012 spring. So, this week uranezu topic is, Yes! "Nitpicking". Speaking about restaurant menu in TDL, I found another concern at "Sweetheart Cafe" offering the breads and sandwiches the counter-service restaurant. The menu board at the restaurant entrance, there is a something funny. "Let's get some lunch at this restaurant!" "Hmmm... What's on the Special Set menu..."
There is no English after the "Smoked" on the menu. Under the menu in English, however, there is "Smoked Salmon" in Japanese. Let's move on to the last nitpicking-thing. This one from TDS. 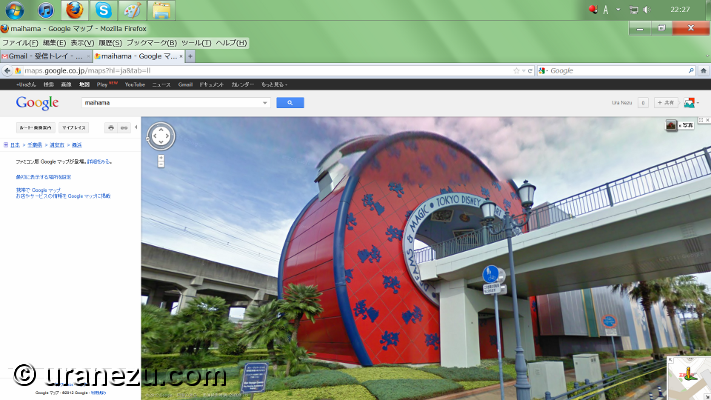 There is a fire department (actually hamburger restaurant) at Cape Cod area in American Waterfront. What should we do if there was an a fire in peaceful village? In April 2012, finally, the Duffy wagon is gone and the firetruck has backed. Villagers live in peace under the original function of the fire department. Disney's Easter is coming in this year again! It's nice to see again a colorful eggs-things and spectacular parade, however compared to a year ago, it seems like there is quite no change of the decoration in the park. Anyway, in this season, Disney's Easter still beautiful and fun, so let's explore! In World Bazaar, at "The Disney Gallery", there are Disney character drawing classes (Sorry, Japanese language only) for a fee. During this Easter season, "Miss Bunny" class has started. After the class, you can bring your drawing with the original plastic case. Why don't you try it? The fee is 1000 yen per person for 50 minutes class. Here are a pictures from hub. There are always packed with people trying to take a best photo. 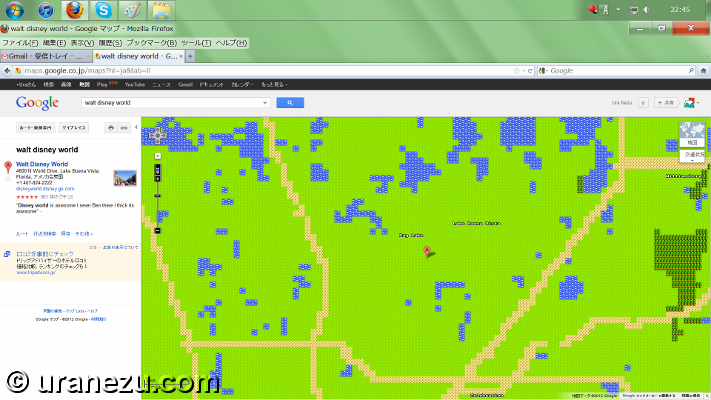 I bet you can find your favorite photo location in this area. During the "Disney's Easter Wonderland", we can enjoy the Egg Hunts in TDL. There are 2 type courses, Standard (500 yen) and Expert (1000 yen). Are you ready? Let's go to egg hunt! It's Brer Rabbit-egg From Critter Country. Jessie & Woddy the eggs at "Slue Foot Sue's Diamond Horseshoe" the show restaurant from Westernland. In this year, the only thing that they changed was its position. There are a covered wagon which the inside is full of Country Bear Band-things. Can you see a part of the blue bonnet? Yes, The Sun Bonnet Trio-eggs! A guy who stand in wilderness. The Donald-egg from Westernland was renewed! It' better than last year. Not small eggs at "It's A Small World" from Fantasyland. Pinnochio & Jiminy Cricket-egg from Fantasyland. It's very cute, however nothing has changed in last year. I hope I can get them someday at Japanese Disneyana. Pluto the egg on the matching yellow flower carpet. Chip & Dale from Toontown. The Micky and Minnie the eggs at Toontown City Hall were also renewed from pie-eyed face to Modern one. Stitch on a drum sounding tiki from Adventureland. A renew Goofy from the balcony of "Pirates of the Caribbean". My favorite eggs from "Cafe Orleans" the counter-service restaurant. "Don't shovel your food into your mouth, Tramp. It's in the presence of Lady!" Lightning & Mater eggs. Can you see a go-cart behind them? The Mike-egg in front of "Monsters, Inc. Ride & Go Seek!". The R2-D2 the egg's in Tomorrowland location was changed. If you follow the R2's gaze, you can find the Star Tours which ready for Star Tours: The Adventures Continue. Are you waiting for a topic about Easter? If yes, please just wait a little longer. Don't worry, Disney's Easter is not gone soon. It is being held in TDL to 30 June. 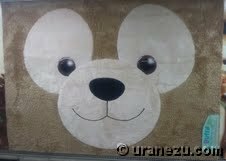 So, today, I report the special event in TDS, it's Disney Walk 2012. Disney Walk 2012 was a 2-days only, separate-admission event in early morning TDS. This special event before normal operation hours was held for the first time in TDR. The below is a details. 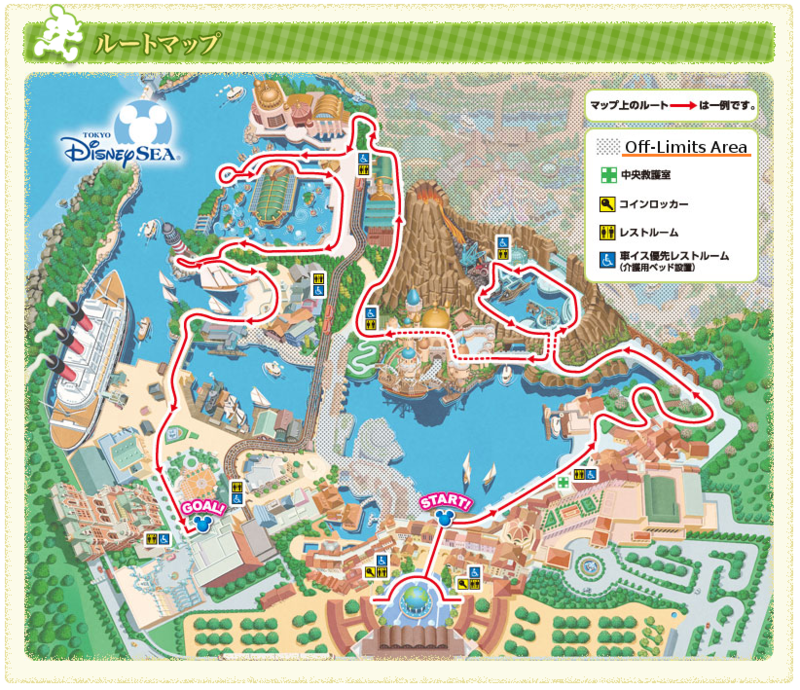 Disney Walk 2012 -Let's take a walk in morning park.- On April 12 and 13, TDS will hold a special event to enjoy walking before the normal operation hours. Let's go for a goal through the park with a beautiful spring greenery in a crisp early morning. To the participants, each person will be given walking map and walking certification. Event Dates: 2012 April 12, 13. Price: 7,800 yen. (one-price-for-all) This ticket include normal operation hours TDS admission. There was no discounts for an Annual Pass holder or DVC member like WDW or other abroad parks. 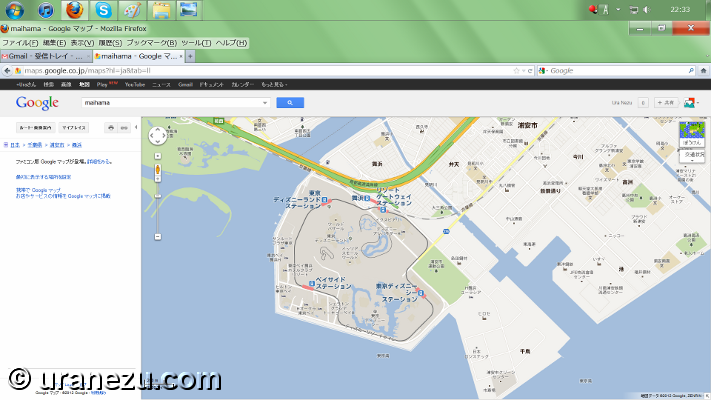 In this event, we couldn't go to Mermaid Lagoon, Lost River Delta because it's Off-Limits Area. So, the below is the report of Disney Walk 2012. There was quite long queue line which wait for a gate to open. I'm not morning person, therefore it was very interesting to me that an entrance with a shutter. When started to enter TDS park, guests had headed for the Mediterranean Harbor. The opening ceremony was held in front of the harbor. the popular photo spots were empty. After the opening ceremony, the exercise dancers saw us off. Let's start! It was very beautiful and laid-back park in the early morning. Here are some unique pictures. The left photo is a Fastpass sign at "20,000 Leagues Under the Sea". The right one was taken near "Fortress Explorations". This rainbow which only can see in the early morning sunshine. The left photo is a pass to Lost River Delta area which was not allowed to enter in this event. The right one is a photo of the guests were heading for the goal. In this Disney Walk 2012, there were some programs. The one of them was a queue line tour of the attraction. The program was prepared at "Journey to the Center of the Earth" and "Tower of Terror". (Just only enjoying the queue, not ride.) The never opened door in normal park operation hours used for the program exit. Another big fun was an art custodial cast members existence! Each of them drew Minnie and Goofy easily. This is a certification medal of Disney Walk 2012. APR. 6. 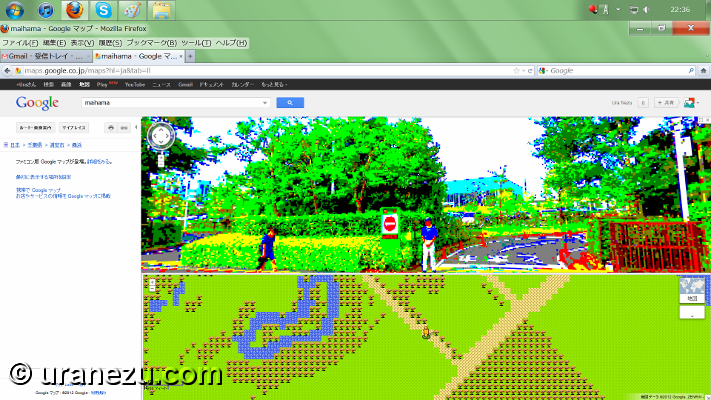 2012 about TDR on Google Maps. Did you expect that I post a topic about Disney's Easter? Sorry, I will post about it in next week because nothing seemed to have changed in last year. By the way, did you have a fun April Fool's Day? 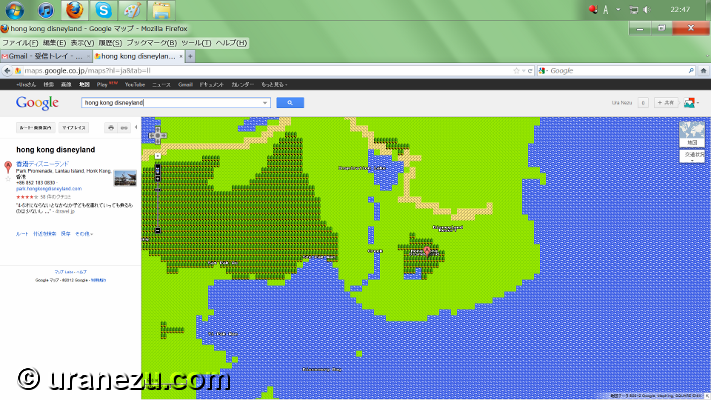 I think you already know that Google Maps have added new version on April 1st, it's a 8-bit Maps. 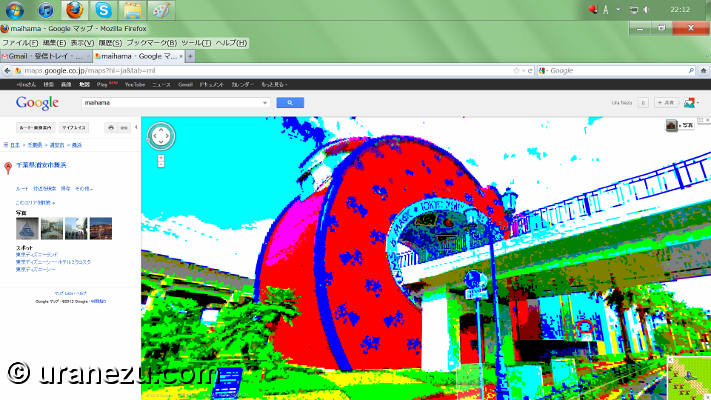 Today, I introduce some street view around TDL on this maps. 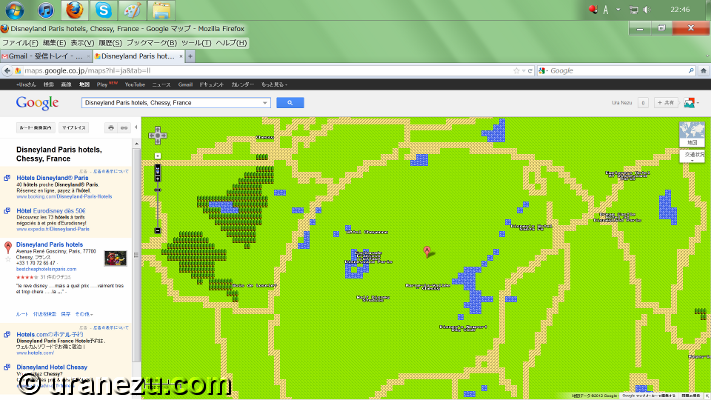 This is 8-bit map version. 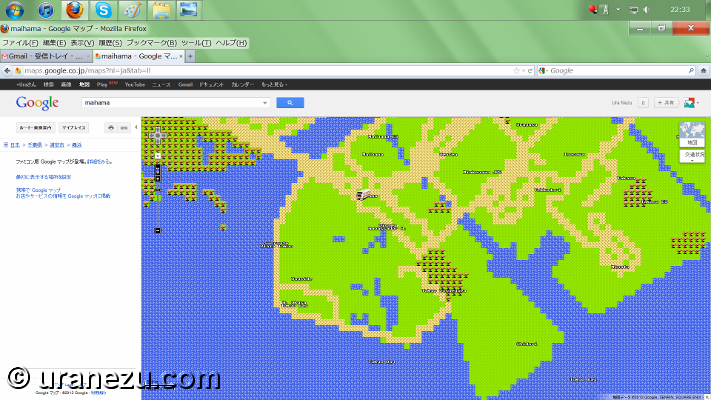 Nice Dragon Quest taste! 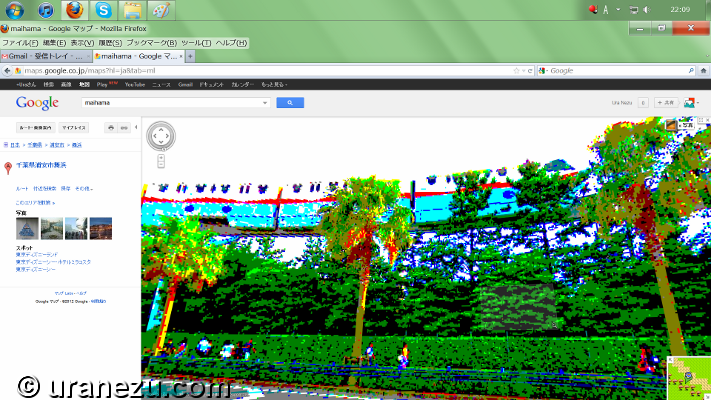 The Below is normal maps. Let's explore with careful attention to avoid monsters. 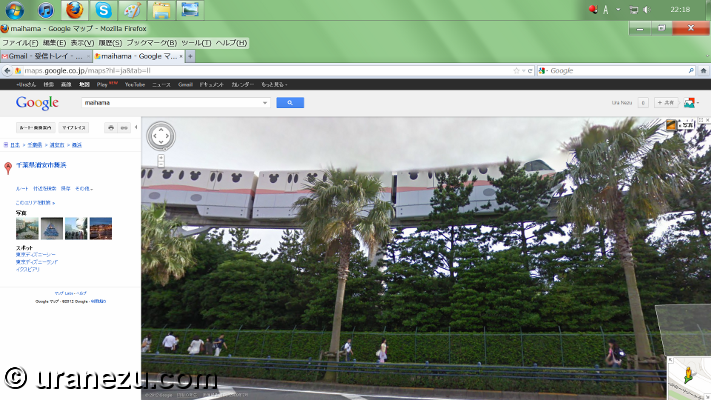 It's monorail, Disney Resort Line. It's "Bon Voyage" the largest merchandise shop out of the parks. This is the newest Disney hotel. Can you see what's entrance? 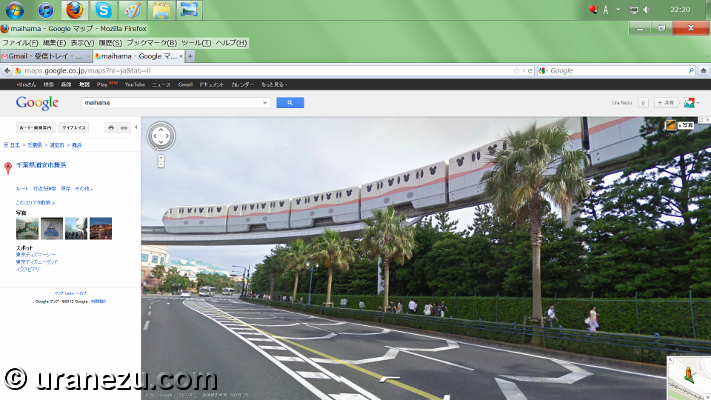 It's the gate of TDR. The red circle is the former theater of Cirque du Soleil. Now, OLC officially announced that is now "Amphitheater". 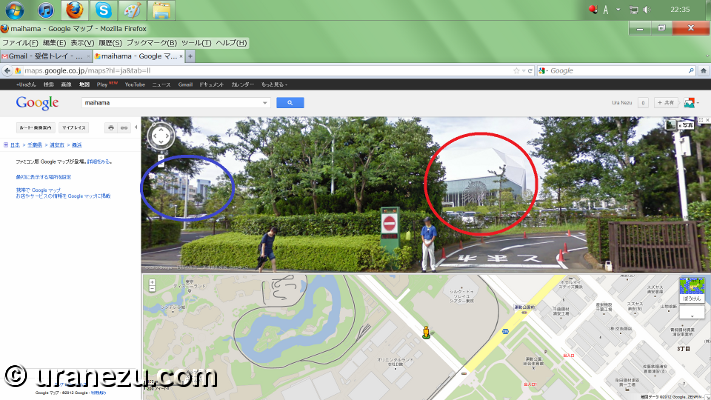 The blue one is "Disney Ambassador Hotel". The last one from near TDS. 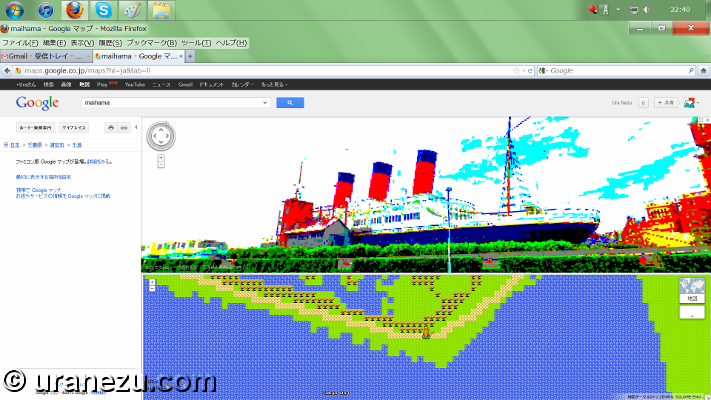 It's "S.S. Columbia" and monorail.